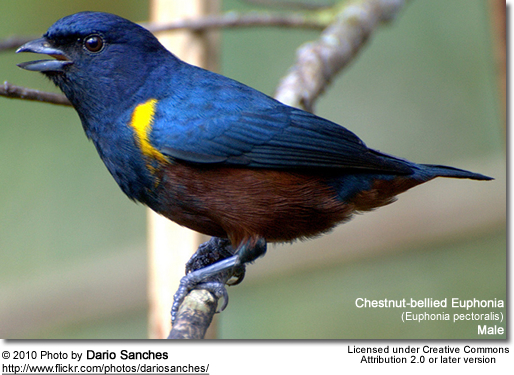 The South American Chestnut-bellied Euphonias (Euphonia pectoralis) are closely related to the Rufous-bellied Euphonias and the Golden-sided Euphonias. 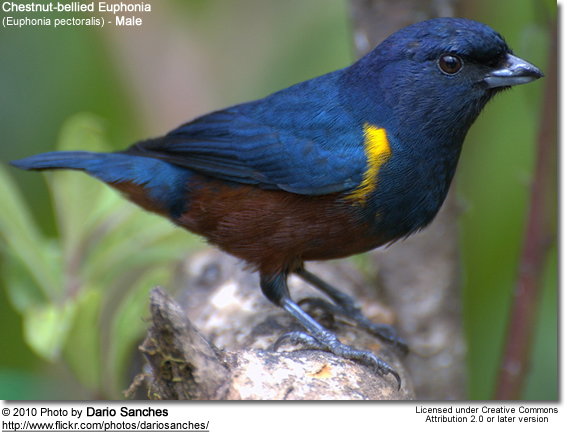 These South American finches occur naturally in eastern and southeastern Brazil (Alagoas; central Mato Grosso and southern Bahia south to Santa Catarina), adjacent eastern Paraguay and northeastern Argentina (Misiones). They are usually seen pairs or may join mixed feeding flocks. They typically remain high in the canopy. 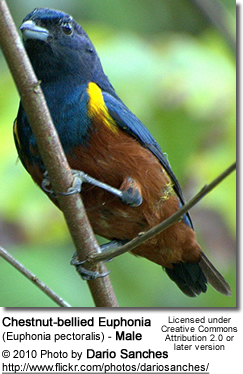 The male's upper plumage is a glossy steel blue down to his chest. The abdomen is chestnut colored and there is a yellow patch at the bend of his wing. 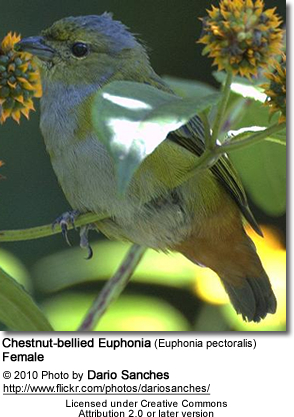 The female's plumage is mostly olive on the back and flanks. She has a grey nape and underparts. She has distinctive reddish-brown undertail coverts (feathers). Their diet consists of a variety of tree-borne fruits. They will also take small insects and nectar. Euphonias are known for their almost constant singing. Their best known calls sound like "Pe-we," and "see-see".